Add this to your must-make list. When I’m at a grocery store I like to check out the service deli case to see what kind of premade salads they sell. These salads are the ones that are sold by the pound (or less) behind a big glass case and generally are located by the deli meats and cheeses that can be purchased sliced and by the pound. If the grocery store you shop at has warm food in the service deli just follow your nose because so often after they fry pieces of chicken or roast whole chickens, it smells SO good. The premade salad sections have sure come a long way from when just potato salad, macaroni salad and coleslaw were available. Now there are so many unique and colorful premade salads available in the service deli at the grocery store. I like to check out the unique salads for recipe ideas. 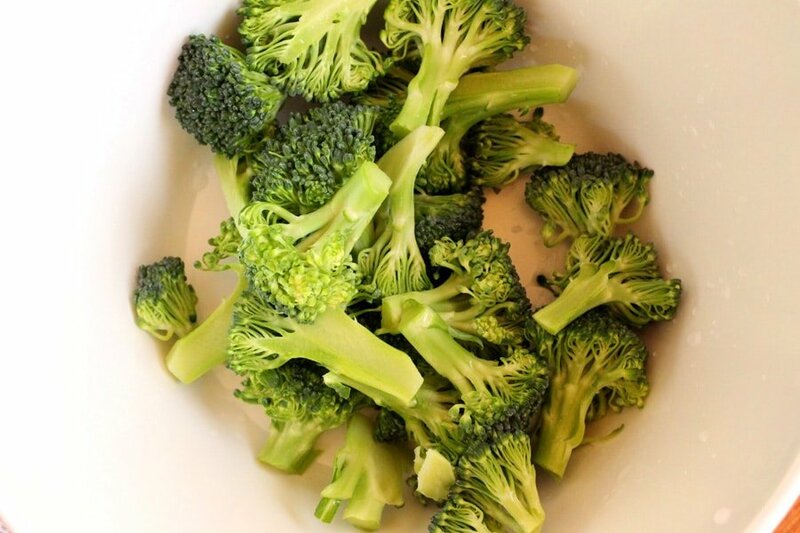 Recently I bought a small container of broccoli salad to try and it was really good. 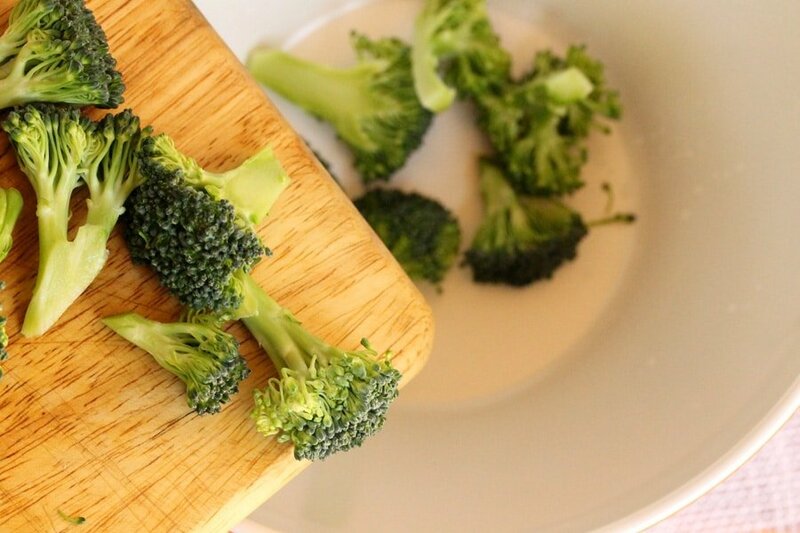 I actually had my doubts because the broccoli was raw and I wasn’t sure if it would have a lot of flavor. But it had great flavor and was reeeeally delicious. 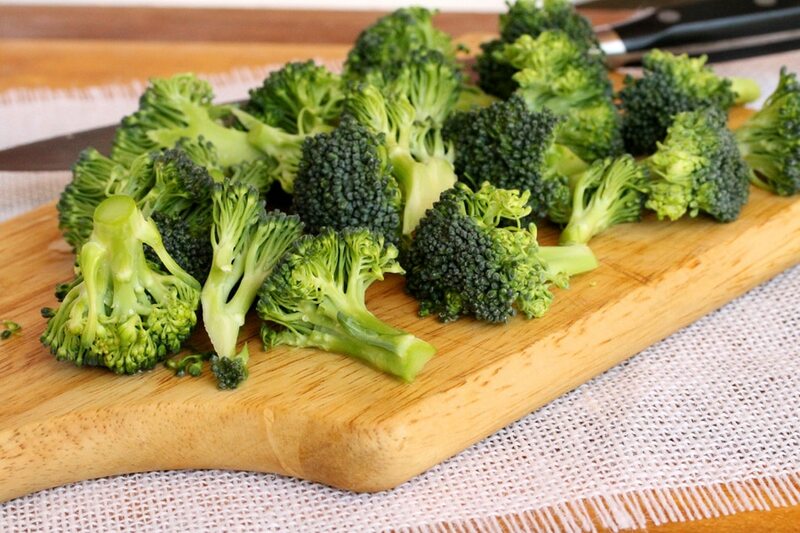 Here’s my rendition of that scrumptious broccoli salad. The fresh ingredients are mixed together with homemade dressing that’s slightly sweet and more on the liquid side. 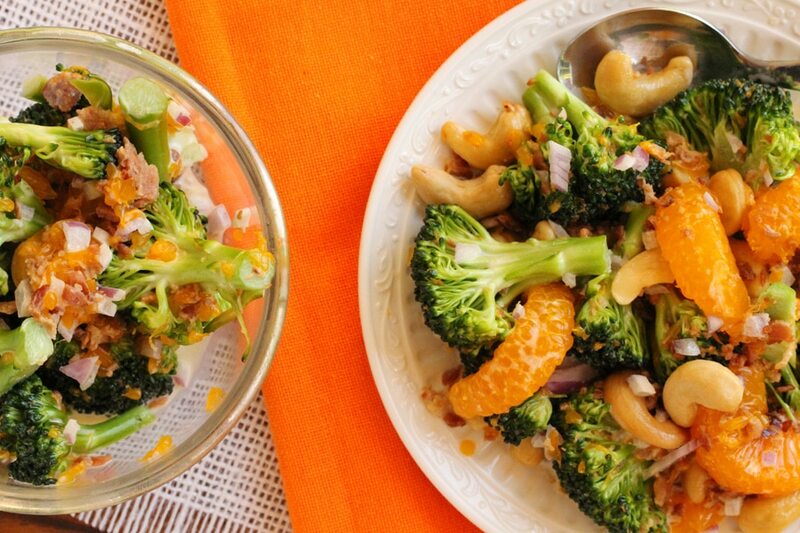 It’s best not to store this salad in the refrigerator for more than a couple hours or the cashews and bacon may become soggy. It just needs to be gently mixed again before serving so that the super tasty dressing lightly coats all of the ingredients. real bacon bits. Set aside. 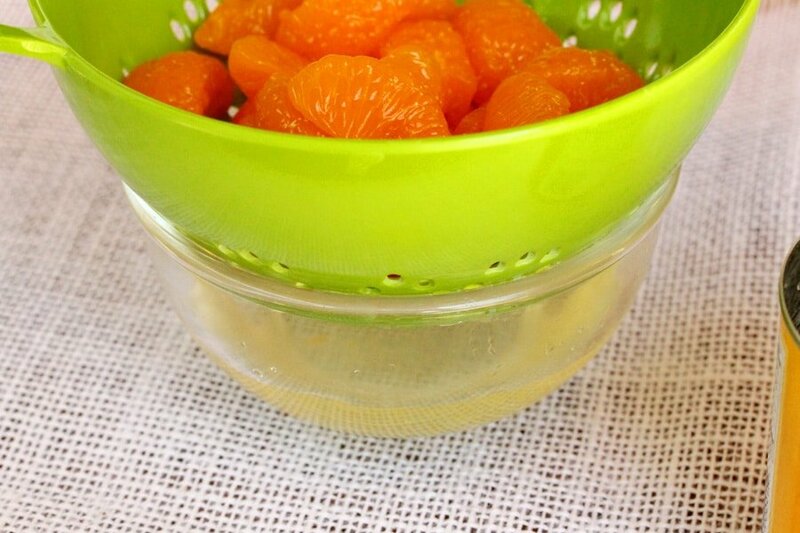 Drain the liquid from the can of mandarin oranges and reserve the liquid if it’s fruit juice. 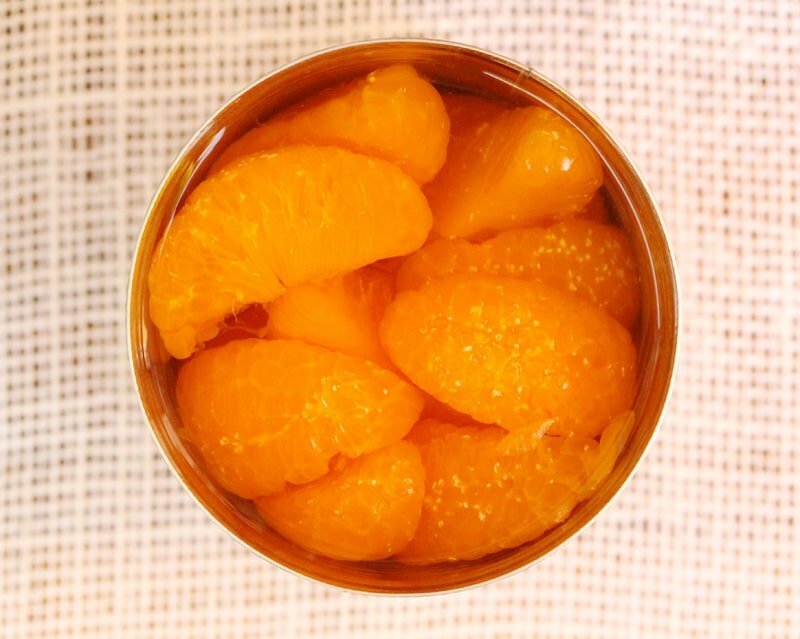 It the liquid in the can of mandarin oranges is not fruit juice, discard the liquid. Set the mandarin oranges aside (it’s best if these are added at the very end). 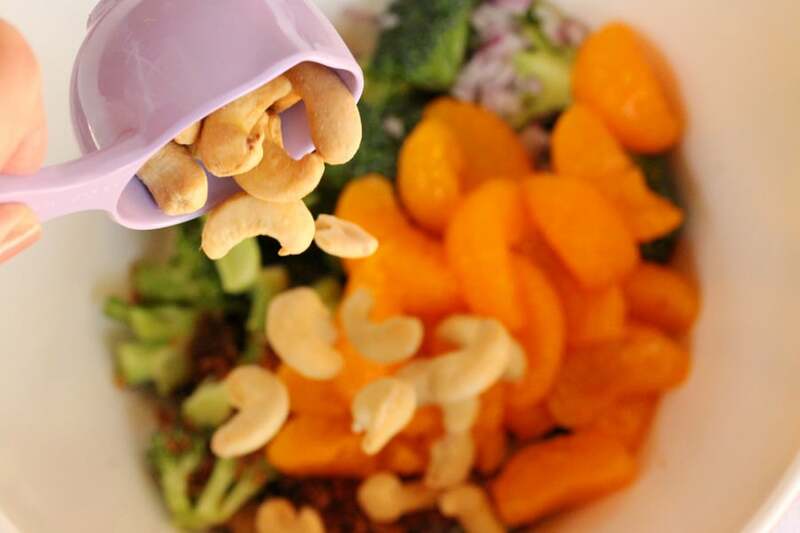 To the bowl, add whole cashews and set aside while making the dressing. 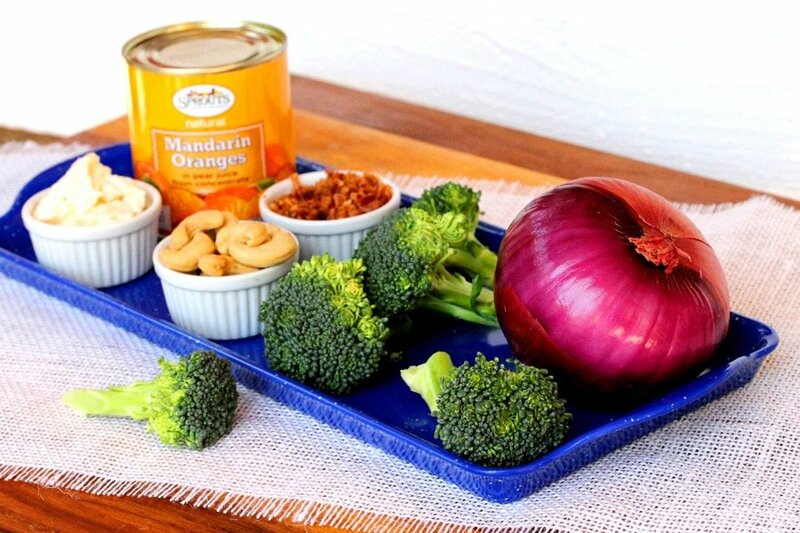 TIP – Although I added the mandarin oranges to the bowl in the picture above, for best results I’d recommend setting the mandarin oranges aside at this point. 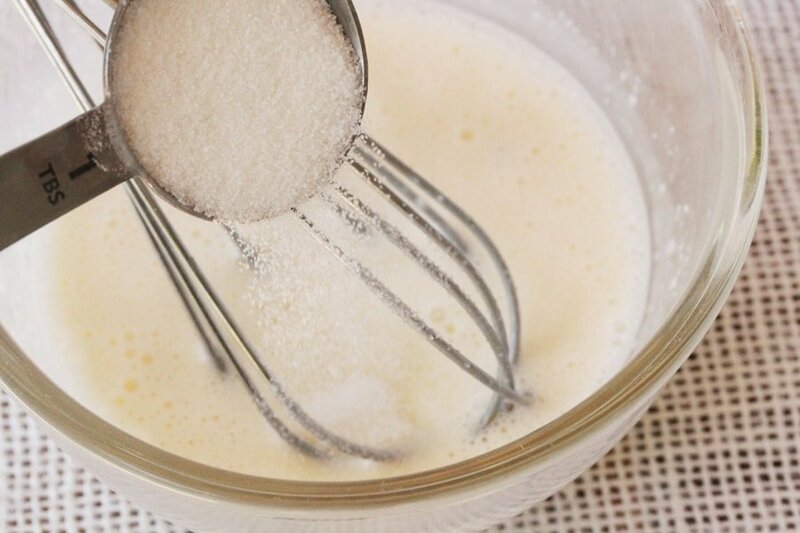 It’s best to add them after mixing the dressing in with the other ingredients. This should prevent the mandarin oranges from breaking apart. 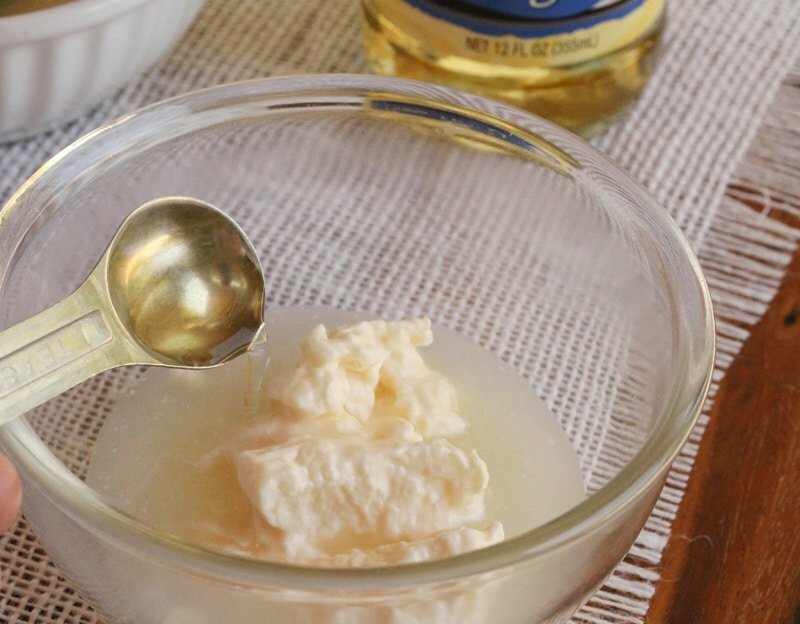 To a small bowl, add mayonnaise. If the liquid in the can of mandarin oranges is a fruit juice, add 2 tablespoons of the juice to the bowl with the mayonnaise. 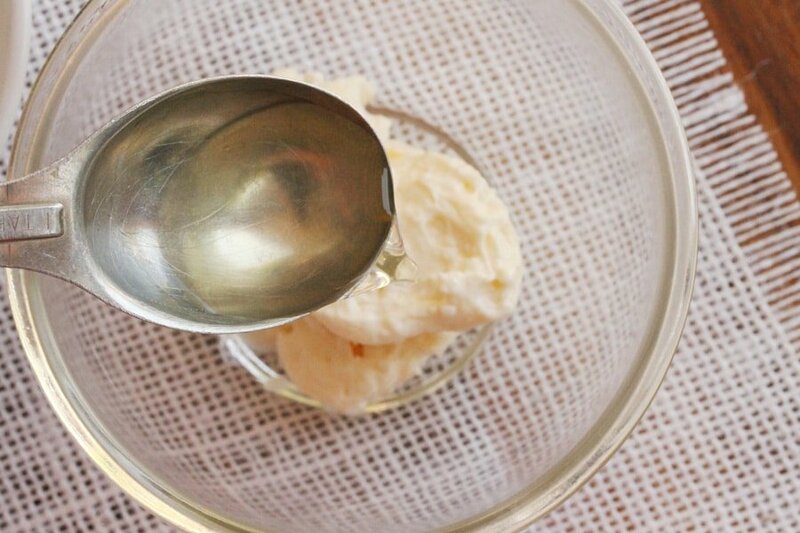 If the liquid isn’t fruit juice discard it, and add 2 tablespoons of apple juice or milk to the mayonnaise instead. 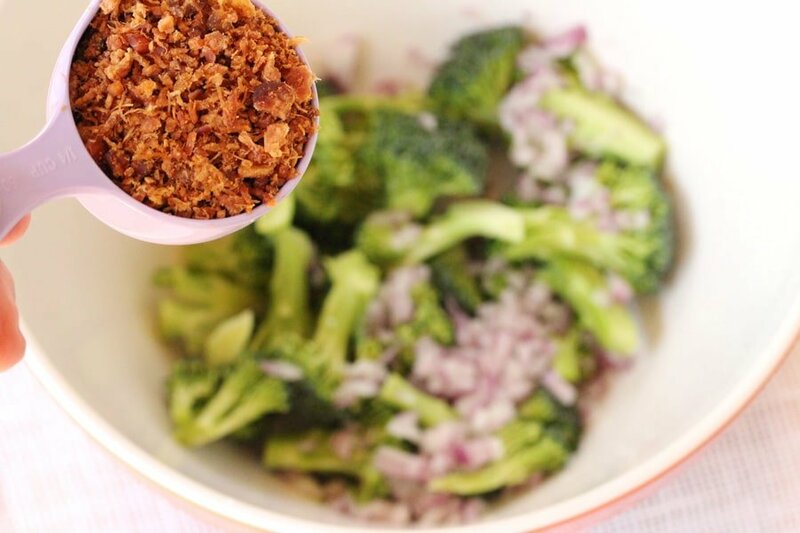 …add the dressing. 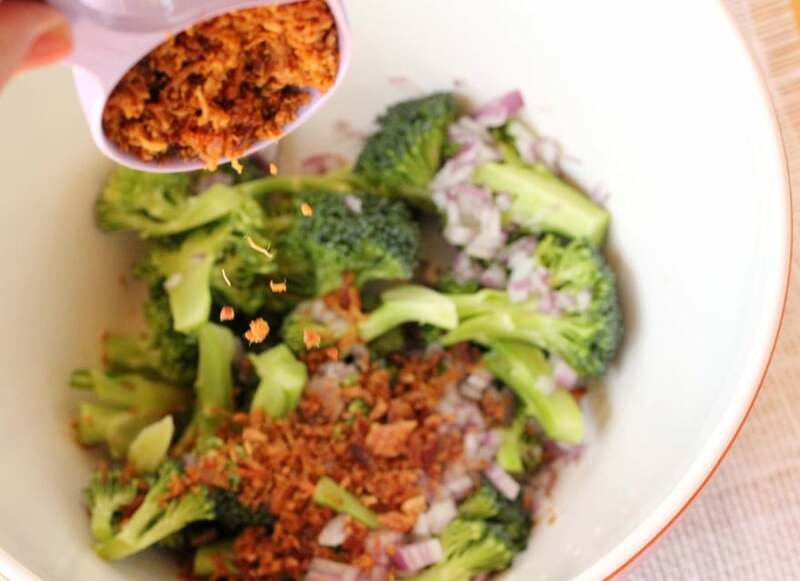 Gently mix to coat the ingredients with the dressing. 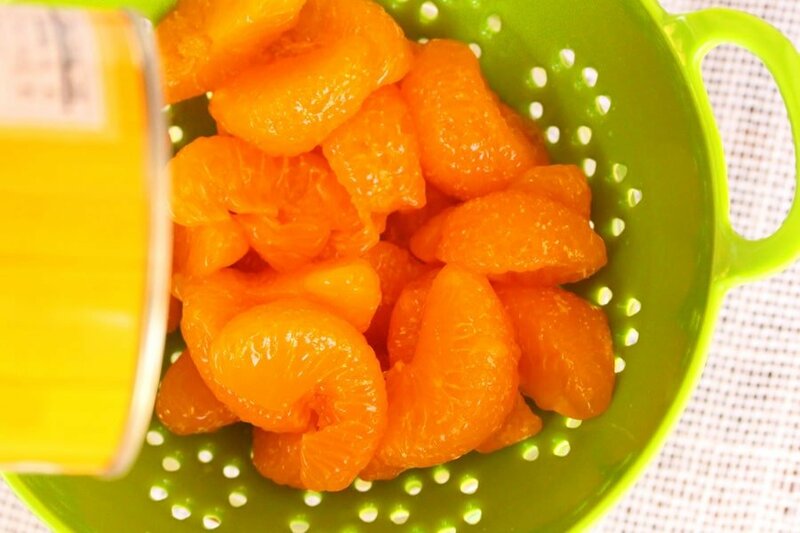 Lastly, to the bowl, add the mandarin oranges and gently mix them into the salad making sure that they stay whole and don’t break into pieces. 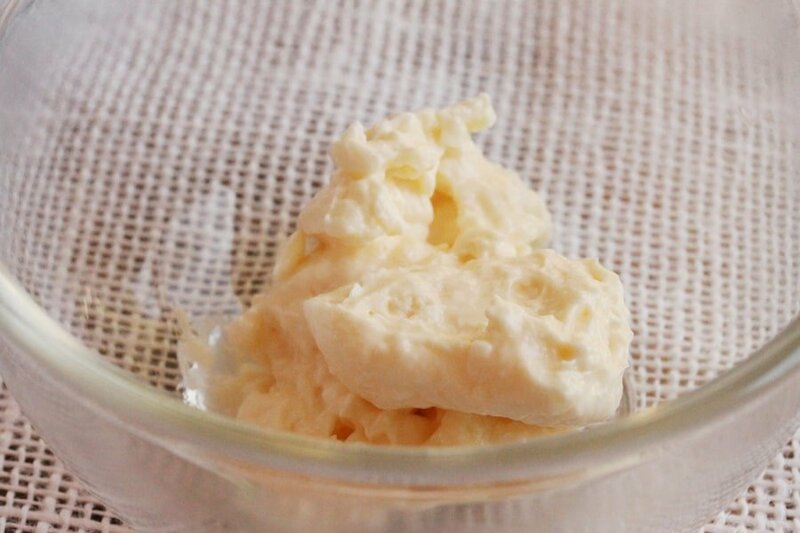 …store in the refrigerator for a short while and serve chilled. It’s best not to store this salad in the refrigerator for more than a couple hours or the cashews and bacon may get soggy. If stored in the refrigerator, gently mix the ingredients again just a little so that the dressing coats all of the ingredients. 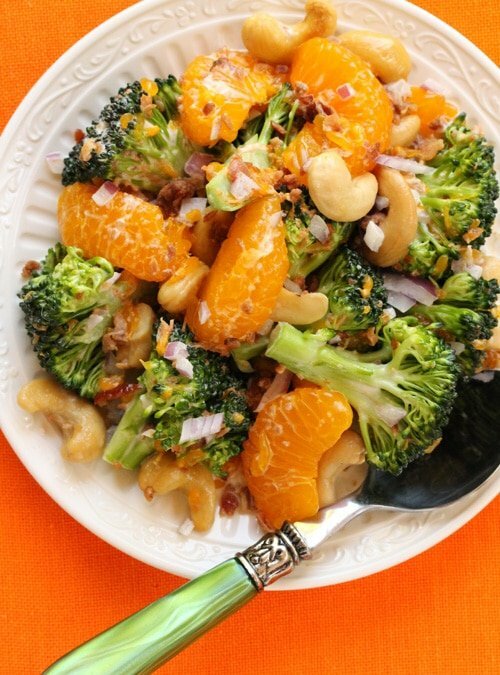 In a large bowl add the broccoli florets, chopped red onion, bacon bits and cashews. Set aside. If the liquid in the can of mandarin oranges is a fruit juice; drain the mandarin oranges and reserve the juice. If it's not a fruit juice, drain the mandarin oranges and discard the liquid. Set the mandarin oranges aside. 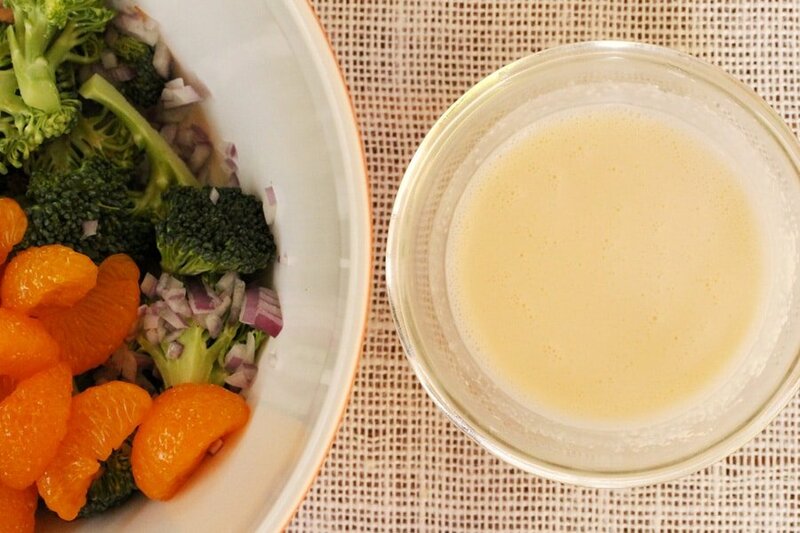 To a small bowl, add mayonnaise and fruit juice from the can of mandarin oranges (if it's not a fruit juice, add apple juice or milk as a substitute). 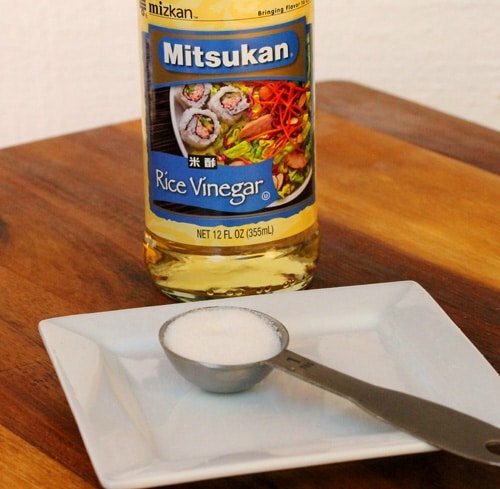 To the small bowl, add rice vinegar and sugar. Whisk together. 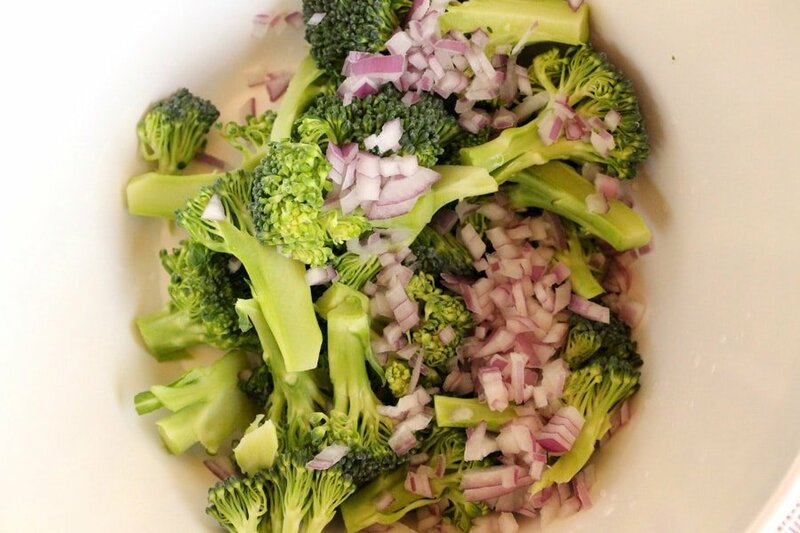 To the large bowl with the broccoli mixture, add the dressing. 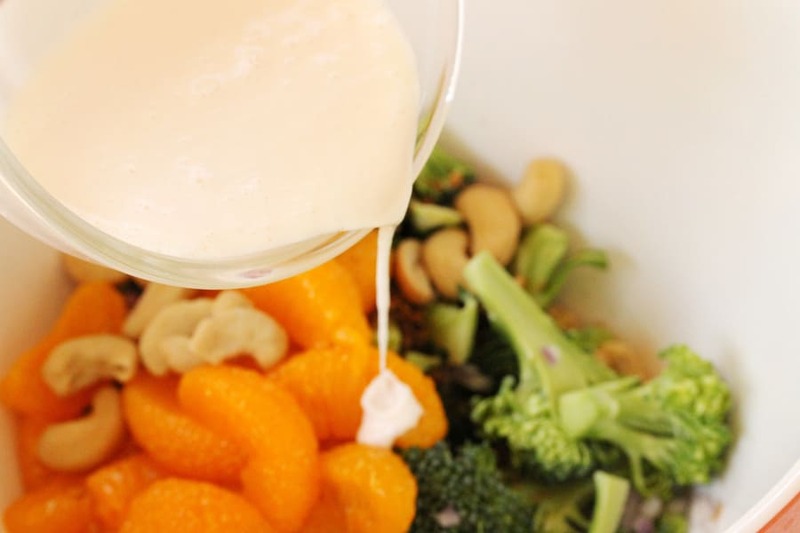 Gently mix to coat the ingredients with the dressing. 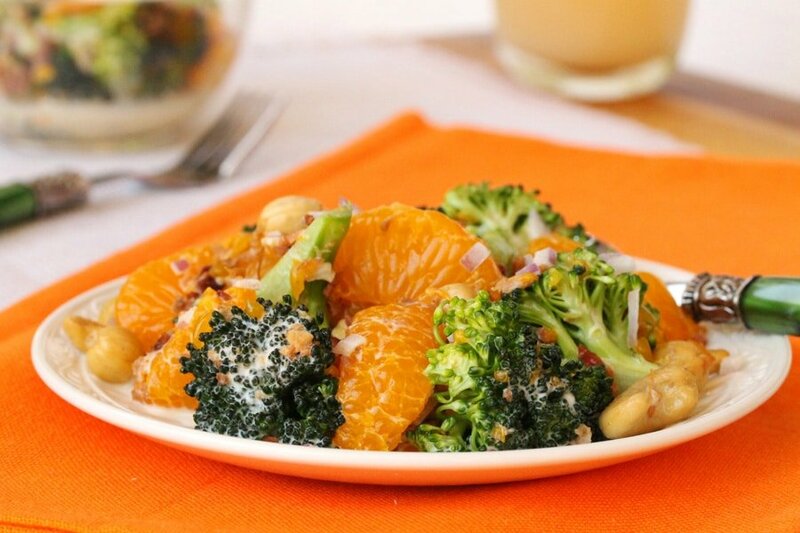 To the bowl, add the mandarin oranges and gently mix them into the salad making sure that they stay whole and don’t break into pieces. Serve chilled or at room temperature. It's best not to store this salad in the refrigerator for more than a couple hours or the cashews and bacon may get soggy. 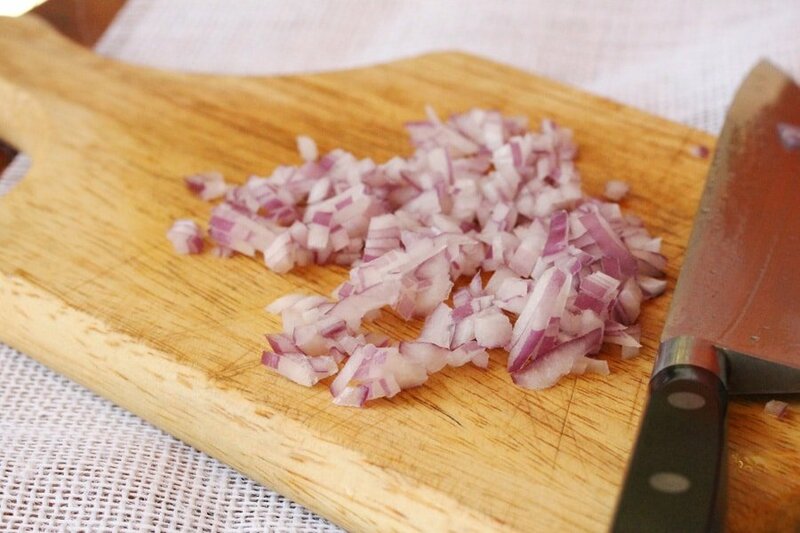 If serving this salad chilled, gently stir it again just before serving. 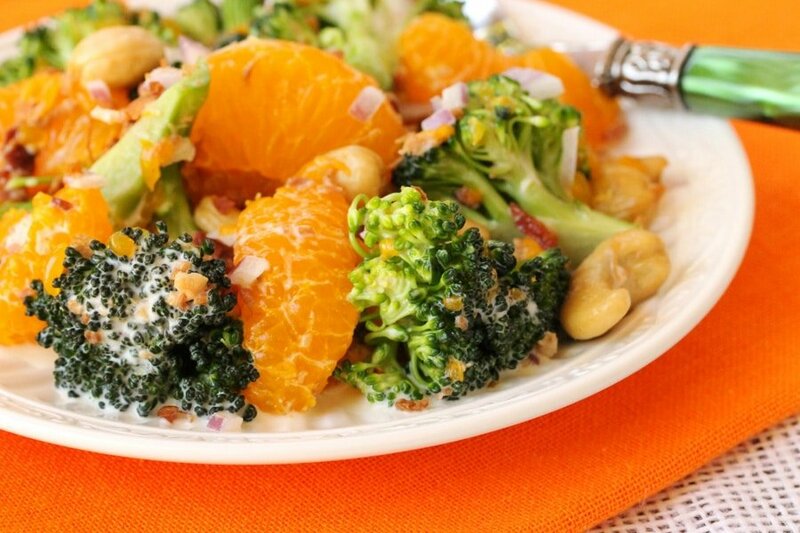 For best results add the mandarin oranges to the salad at the very end after mixing the dressing in with the other ingredients. This should prevent the mandarin oranges from breaking apart. 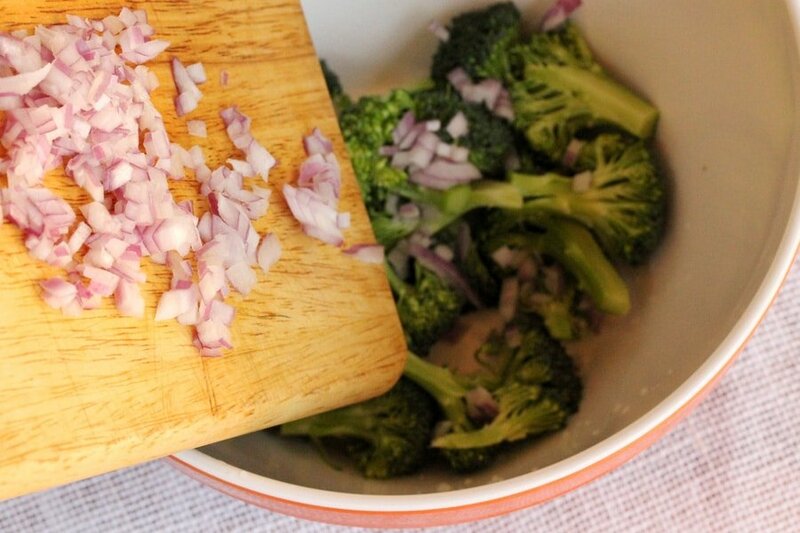 I pinned this recipe recently & just got around to making it for tonights dinner! the only thing I did was had a 3 or 4 slices bacon I had baked, instead of the bacon bits. I must say I really enjoyed it, & will sure be making it again. Thanks for sharing. Hi Christine, so glad you liked it and I’m sure your baked bacon made it even better. Thank you for letting me know. Have a great week! This not only looks delicious, but it looks like sunshine on a plate! Wow this looks like a salad even I would eat. 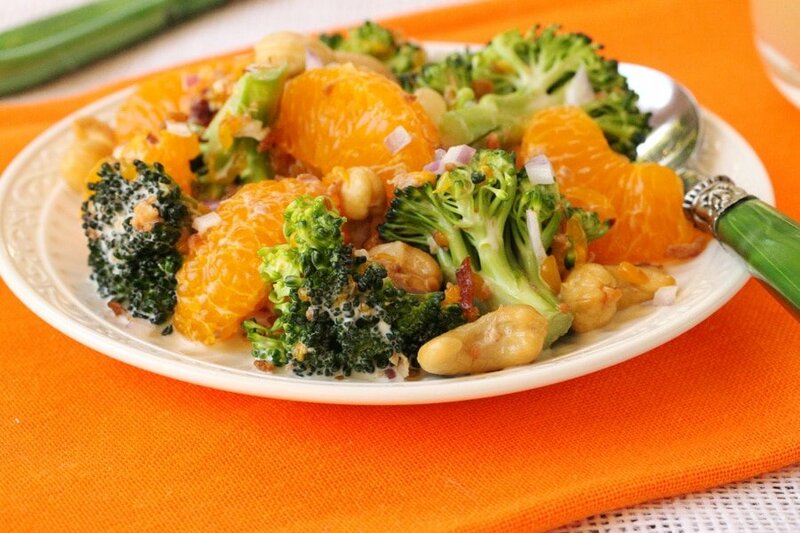 Love mandarins and a huge fan of broccoli. I must try this one. I just got some mandarin oranges recently for a salad but was not really sure how I would build the salad. Now I will not have to search or wonder any more-bingo the salad is right here. Great ingredients and it is really well rounded. The dressing looks like a must as well. Thanks for posting this!